The Dan Workman Studio Log: Glenna Bell joins our Garage Band Allstar Line Up!! 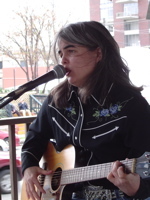 Glenna Bell joins our Garage Band Allstar Line Up!! Glenna Bell, our DWMusic newest Artist Development client, has joined the ranks of Sarah Sharp and the Southern Backtones, AND John Evans by having her song, "Hoping I Could Be Wrong" be track of the day on Wednesday March 30th!!! Constant readers of this journal will be familiar with the almost embarrasing praise we get from our peer reviewers on Garage Band. One thing we have learned for sure is that other musicians LOVE our artists' work. Another talent for the Suga'Hill family. Dan Workman Music Has New Faces!!!! !